Urban community gardens (UCGs) have become prevalent worldwide and play a significant role in strengthening the sustainability of urban food systems. Although UCGs provide multiple benefits to society, the extent to which vegetables grown in them are contaminated by chemical compounds derived from airborne fallout or soil contamination is unclear. We evaluated the influence of both air pollution and the contamination of garden soil beds on the contents of 16 PAHs in the edible tissues of spinach and collard green. The PAH contents were quantified using gas chromatography-mass spectrometry (GC-MS-EI). The concentrations of PAHs in both the vegetables grown in the vessels and in the soil of the UCGs were <0.1 μg kg−1. The total concentrations of the 16 priority PAHs in the soil beds ranged from 132.94 to 410.50 μg kg−1. These levels were lower than those that have been reported from other urban areas. Principal Component Analysis resulted in two components indicating that traffic-derived emissions are the main sources of PAHs in the soil. The first component represented the compounds with higher molecular weights and had a moderate loading for the fine fraction of the soil (clay) (0.63). The second component showed a high loading for silt (0.97), including those PAHs with lower molecular weights. Our data show that spinach and collard greens do not accumulate significant PAH concentrations on their leaves over 45-day periods, whether they are raised in controlled soil or in local beds. Urban community gardens (UCGs) for food production have become increasingly prevalent worldwide playing a significant role in strengthening the sustainability of urban food systems (Ghose and Pettygrove, 2014; Guitart et al., 2014; Purcell and Tyman, 2015). Several studies have shown the multifunctionality of UCGs, which are associated with economic, social, and environmental benefits to society (Guitart et al., 2014; Hartwig and Mason, 2016; Milliron et al., 2016). On the other hand, mounting pressures on environmental resources in urban areas result in soil depletion and/or contamination and high levels of air and water pollutants, raising questions about how safe it is to cultivate food in megacities such as Sao Paulo. Contaminants found in vegetables grown in cities are usually derived from previously contaminated soil or atmospheric pollution (Säumel et al., 2012; de Temmerman et al., 2015). We have previously demonstrated the accumulation of elements and genotoxic effects due to air pollution absorbed by leafy vegetables in UCGs (Amato-Lourenco et al., 2016a,b). Polycyclic aromatic hydrocarbons (PAHs) have aroused increased concern due to their ubiquitous occurrence in urban air. Some of these compounds have toxic, mutagenic, and/or carcinogenic properties (Abdel-Shafy and Mansour, 2016). Pyrogenic PAHs in urban centres are mainly derived from incomplete combustion in motor vehicles and are distributed as gases and ultrafine particles (Marr et al., 2006; Chrysikou et al., 2009). In Sao Paulo, atmospheric pollutants result mainly from the vehicular fleet of 8 million vehicles (CETESB Sao Paulo State Environmental Agency, 2015a; Martins Pereira et al., 2017). Petrogenic PAH sources are common in cities, due to the transportation, storage, and use of crude oil and its products. Major sources of petrogenic PAHs include storage tank leaks and the accumulation of small releases of motor oil, gasoline, and other substances related to transportation (Abdel-Shafy and Mansour, 2016). In Sao Paulo, PAHs from the atmosphere are still emitted by primary combustion sources such as gasoline; in Brazil, automotive fuel is a mixture of pure gasoline and 25% anhydrous ethyl alcohol (Bourotte et al., 2005). In Sao Paulo, leakages in fuel facilities are considered to be the main source of soil contamination. In December 2015, 2,054 gas stations within the city that were associated with soil contamination issues (73% of total contaminated sites) were indexed by the Sao Paulo State Environmental Agency (CETESB Sao Paulo State Environmental Agency, 2015b). The absorption of PAHs by vegetables may occur by foliar or root uptake, and their absorption is directly related to the nature of PAH compounds, their physicochemical characteristics and plant physiological conditions (Wang et al., 2011). The contents of PAHs in foliage are primarily correlated with air ambient levels. The relationship with soil PAH concentrations is not as strong, due to the relatively small influence of root uptake mechanisms, which are related to the low degree of soil/plant partitioning that results from the lipophilic properties of PAH molecules (Tuteja et al., 2011). However, direct contact between certain leaf crops and contaminated soil may result in increases in PAH levels (Delschen et al., 1999). Usually, vegetables reflect short-term changes in air pollution, whereas soil is subject to long-term changes that are due to cumulative deposition (Jones, 1991). Very few studies have been conducted regarding the concentrations of PAHs in the vegetables and soil beds of UCGs (Marquez-Bravo et al., 2016), and no studies have addressed the influence of air pollution on the contents of PAHs in vegetables grown in UCGs. In this study, we characterized the concentrations of 16 PAHs classified by the US EPA as priority pollutants in 9 UCGs in Sao Paulo and one control site. We attempted to determine the effects of both air pollution and the contamination of soil beds on the contents of PAHs in two leafy vegetables over a 45-day period. Nine UCGs located in inner-city neighbourhoods of the municipalities of Sao Paulo and Osasco were selected for this study (Figure 1A). Several of these UCGs were examined in previous studies that assessed the influence of air pollution on elemental concentrations of leafy vegetables (Amato-Lourenco et al., 2016b) and performed biomonitoring of the genotoxic effects of air pollution (Amato-Lourenco et al., 2016a). These sites are located in urban areas where vehicles represent the main source of air pollution (CETESB Sao Paulo State Environmental Agency, 2015a). An organic farm in Piracaia, a city with low atmospheric pollution in the rural area of the state of Sao Paulo, was employed as a control site. Figure 1. (A) Locations of exposure and sampling in the municipalities of Sao Paulo and Osasco. (B) Experimental setting of controlled vessels in urban garden “F.” (C) Vegetable samples prior to exposure (D) Collard greens after 45 days of cultivation in a bed of soil (E) View of urban garden “G,” which is located close to an area with high traffic density and constant traffic jams. Garden identifiers are not publicly available to protect garden identity. The PAH concentration found in the PM2.5 (≤2.5 μm) sampled in an intensive campaign during the winter of 2014 (Martins Pereira et al., 2017) were 23.3 ng m−3 highlighting the contribution of vehicular emissions. Brassica oleracea var. acephala (collard greens) and Tetragonia tetragonioides (New Zealand spinach) were selected, considering the quantities of these vegetables consumed in Brazil (Ministry of Health of Brazil, 2014) and the differing physical characteristics of the leaves of these plants. The leaves of these plants differ in terms of roughness, the thickness of the cuticular wax, and the presence or absence of leaf hairs. These traits may influence the incorporation of PAHs from atmospheric particulate material or through the volatilization of materials deposited in the soil. Organic seedlings were cultivated for 20 days in an unpolluted rural area where pesticides or fertilizers had not been previously used. Five parallel replicates of each species were then transplanted simultaneously to high-density polyethylene vessels (width: 50 cm, length: 90 cm, and volume: 0.1 m2) that had been washed and decontaminated with 20% HNO3 before being filled with an uncontaminated standard soil substrate with a density of 500 kg m−3; a pH of 5.8 ± 0.5 and an electric conductivity of 2.5 ± 0.3 mS cm−1 that contained 9% organic matter; this material is called controlled soil. Additionally, another five replicates of each species were planted directly in the beds of each garden. The beds of uncontrolled soil contained a mixture of materials, which included topsoil or externally sourced clean soil, amendments, and tree leaves; most urban gardens in Sao Paulo follow agroecological principles (Guthman, 2000). None of the garden beds were installed on asphalt or had creosote-treated timber sidewalls. The mean Euclidean distance from heavily trafficked roads was 130 m; one garden was located less than 15 m from a road (Marquez-Bravo et al., 2016). One garden was located within 40 m of a local potential source of petrogenic PAHs (Table 1). Table 1. 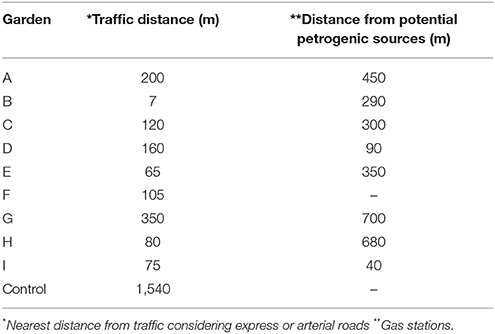 Distance of UCGs and traffic/petrogenic sources. The vegetables were exposed during 45 days, which corresponds to the average growth cycle of both vegetables. This period extended from June to August 2016, which corresponds to the period of high air pollution levels at the studied sites (CETESB Sao Paulo State Environmental Agency, 2015a). No additional fertilizers or pesticides were used at any time during the study period. The leaves were harvested from the vegetables and immediately stored in a sealed sample container to reduce PAH losses due to volatilization. All of the samples were transported on ice and were kept in aluminium foil packages. In the laboratory, the vegetables were washed for 2 min with ionic load-free water and immediately frozen (−20°C) until analysis. The controlled and uncontrolled soils were sampled after 45 days at six defined points in each vessel and at a soil depth extraction range of 0–15 cm. A total amount of 500 g was collected, as recommended by Boulding (1994). The protocol used for storage and transportation of the soil was the same as that used for the vegetables. All of the data from the samples analysed in this study are reported as fresh weight (f.w.). The daily mean values of temperature (°C), relative humidity (%), rainfall (mm), and wind velocity (m s−1) in the region surrounding each garden during the study period were obtained from the Emergency Management Centre of the Municipality of Sao Paulo. 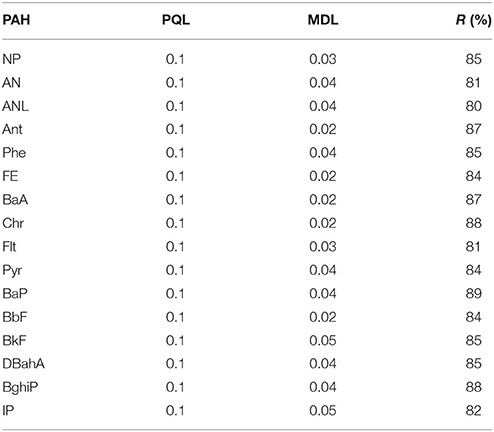 The 16 PAHs that are classified by the US EPA as priority pollutants based on their toxicity, potential for human exposure, and frequency of occurrence were quantified (Table 2) (Bojes and Pope, 2007). Seven of these PAHs (benzo[a]pyrene, benz[a]anthracene, chrysene, benzo[b]fluoranthene, benzo[k]fluoranthene, dibenzo[a, h]anthracene, and indeno [1,2,3-cd]pyrene) are classified as probable human carcinogens (IARC, 2010). Table 2. Selected physical–chemical properties and carcinogenicity classification of the 16 PAHs classified by the US EPA as priority pollutants. An aliquot of disintegrated and freeze-dried plant material and soil sample (~0.50 g) was transferred to an inert glass jar, and sodium sulphate (Na2SO4) was added to retain the water present in the sample. Subsequently, dichloromethane (CH2Cl2) was added to the sample. The mixture was sonicated for 45 min. The extract was concentrated to a volume of 1 ml, which underwent a clean-up process in which the PAHs were separated from the saturated and unsaturated hydrocarbons (THP). Then, 1 ml of extract containing the PAHs was injected into a gas chromatography (GC) system (Agilent 7890a, Agilent Technologies, Santa Clara, CA, USA) coupled to a mass spectrometer (MS) (Agilent 5975c, Agilent Technologies, Santa Clara, CA, USA) and operated in electron impact mode at 70 eV. The compounds were carried out through a capillary column Agilent VF-5MS 30 m, 0.25 mm, (0.50 μm) 10 m EZ-Guard. The temperature of injector was 300°C using the split/splitless injection mode. The ion source temperature was maintained at 250°C and the GC–MS transfer line temperature was set at 280°C. A standard PAH mixture (Ultra Scientific PM-612) containing AN, ANL, ANT, BaA, BaP, BbF, BghiP, BkF, Chr, DBahA, Flt, FE, IP, NP, Phe, and Pyr was used for calibration. An internal standard mixture (200 mg L−1) (Accustandard® Inc, New Haven, CT, USA) was used prior to analysis. The data acquisition was performed using the software Enhanced MSD Chemstation (Agilent Technologies, Santa Clara, CA, USA). One blank sample was prepared for each sample batch and analysed to evaluate analytical bias and precision. The plant and soil samples were analysed in triplicate. To verify the accuracy and precision of the analytical procedures, recovery experiments were conducted by spiking the vegetable and soil samples with a mixture of standard PAHs. 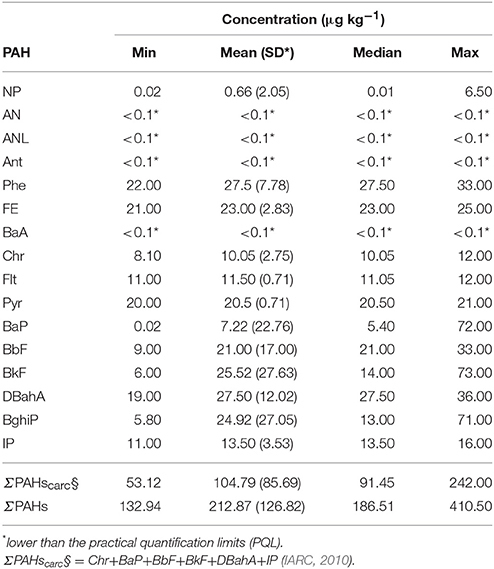 The reproducibility of the method was evaluated through the coefficients of variation associated with the measurements of each PAH performed during recovery tests. Granulometric analysis was performed by sedimentometry. Measurements of pH were made on bulk, non-sieved samples using a pH meter (Quimis Q400a, Sao Paulo, Brazil) [the ratio of water to soil was 2.0:1 (v/w)], according to the methodology proposed by Van Raij et al. (2001). All soil samples were analysed in triplicate. Comparisons between groups were performed using the Kruskal-Wallis test. A Principal Component Analysis (PCA) using varimax orthogonal rotation with Kaiser normalization was used to establish the relationships among the measured PAH levels in the soil and physicochemical properties. All statistical analyses were performed using IBM SPSS software (version 22, IBM Corp., Chicago, IL, USA). The practical quantification limits (PQL), method detection limits (MDL), and the recovery data are presented in Table 3. In general, the recoveries obtained were satisfactory for determinations at the μg kg−1 concentration (R > 80%). Blank levels of analytes were normally very low and in most cases not detectable. Table 3. Practical quantification limits (PQL), method detection limits (MDL), and recovery (R) of PAHs in the soils and vegetables (μg kg−1). The concentrations of PAHs in the leaves of vegetables grown in both the vessels and the soil beds were <0.1 μg kg−1 (below the limits of detection), except for the concentration of DBahA in one UCG (garden “G”−7.4 μg kg−1) in spinach leaves (Supplementary Material). Additionally, the levels of PAHs in the controlled soil vessels of all UCG were <0.1 μg kg−1 after the exposure period (Supplementary Material). However, the total concentrations of the 16 PAHs in the uncontrolled soil (summarized in Table 4) varied from 132.94 to 410.50 μg kg−1. The total concentrations of the 7 PAHs classified as probable human carcinogens ranged from 53.12 to 242.00 μg kg−1. At the control site, the concentrations of PAHs in the soil of the beds and vessels were <0.1 μg kg−1. Table 4. Descriptive statistics for the concentrations of 16 PAHs in the uncontrolled soil of 9 community gardens. BghiP and BkF were the PAH components that appeared more frequently, being present in five of the UCGs. 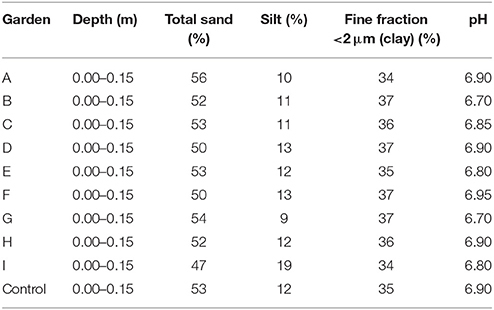 The physicochemical characteristics of the bed soil profiles are presented in Table 5. The pH values of the garden soil ranged from 6.70 to 6.90, and there were no significant differences among the gardens (p > 0.05). Table 5. Physicochemical characteristics of the uncontrolled soil profiles of the community gardens. The daily mean air temperature oscillated from 8.2–28.9°C, whereas relative humidity ranged from 16 to 99.9%. The rainfall varied from 0 to 6.58 mm, and the wind velocity varied from 0 to 2.2 m s−1. No significant differences in the temperature (p = 0.62), relative humidity (p = 0.69), and rainfall (p = 0.30) were observed among the gardens. Wind velocity presented significant differences (p = 0.02) among the gardens. Figure 2 shows the mean values of the weather variables during the period of exposure. Figure 2. Weather conditions: mean temperature, humidity, rainfall, and wind velocity for the 9 urban gardens and the control site during the period of exposure. Using PCA analysis, two components (total cumulative variance of 87.3%) were identified after varimax rotation was performed to permit clearer resolution of the eigenvalues. Factor loadings <0.3 were considered to be insignificant and were omitted from Table 6. The first component accounted for 71.69% of the variance and showed the highest loadings for BaP, BbF, BghiP, BkF, DBahA NP, and a moderate loading for the fine soil fraction, which may indicate a common emissions source for these compounds. The loading values for this component were >0.76, suggesting a high collinearity among these PAHs. The second component had higher loadings (>0.72) for Chr, Phe, Flt, FE, IP, Pyr, and Silt and explained 15.61% of the variance. The compounds AN, ANL, Ant, and BaA were not employed in the PCA analysis because their concentrations were all below the limit of quantification. Table 6. Factor loadings of the rotated component matrix for the soil (% var, % of variance). In this study, we conducted a quantitative assessment of the concentrations of 16 PAHs in two leafy vegetables grown in UCGs in Sao Paulo. Our data show that, over 45-day periods, spinach and collard greens raised in controlled soil or local beds do not accumulate significant PAH concentrations on their leaves. Except in a single garden, located <15 m from a very heavily trafficked street, we found the PAH from pyrogenic sources DBahA (7.4 μg kg−1) in spinach leaves. To our knowledge, this is the first study to assess the influence of air pollution and soil contamination on the PAH contents of vegetables grown in UCGs. Kang et al. (2017) exposed spinach and brassicas during 90 days to atmospheric air with controlled, non-contaminated soil in the city of Nanjing, China, during the winter haze period. These authors showed that the found concentrations of PAH in washed leaves could be potentially carcinogenic for daily consumption. In our study, the concentrations in PAH in washed leaves were much lower than the ones found in that study. The different magnitude of atmospheric PAH concentrations in these cities (Sao Paulo: 23.3 ng m−3; Martins Pereira et al., 2017, Nanjing: 18.0 μg m−3; Kang et al., 2017) might explain our results. It is also possible that the exposure period (45 days) was not enough to cause accumulations. This exposure was chosen because of the growth plant cycles of spinach and brassica. Our results from samples collected from UCG soil beds (0.13–0.41 mg kg−1) are below the levels reported by most studies previously performed in urban or industrial areas. Only one garden presented higher levels and different types of PAHs in its beds, and that garden was located close to a petrogenic source. However, no contamination of the vegetables in this garden was detected. The concentrations of PAHs in soil in urban centres usually reflect past contributions from point or diffuse sources, including past land use and disposal practices (Marquez-Bravo et al., 2016). The ranges of concentrations of the 16 PAHs identified by the US EPA as priority pollutants found in the soils of New York, USA; Bitterfeld-Wolfen, Germany; Guangzhou, China; Shanghai, China; Kathmandu, Nepal; Panipat, India; and Isfahan, Iran were 0.1–149.5 mg kg−1 (Marquez-Bravo et al., 2016); 0.03–7.0 μg kg−1 (Wennrich et al., 2002); 0.04–3.1 mg kg−1 (Chen et al., 2005); 0.08–7.22 mg kg−1 (Wang et al., 2013); 0.17–0.68 mg kg−1 (Aichner et al., 2007); 0.13–0.17 mg kg−1 (Tuteja et al., 2011); and 0.06–11.73 mg kg−1 (Moore et al., 2015), respectively. To our knowledge, only one study has analysed the concentrations of PAHs on soil within the urban area of Sao Paulo, in a remnant part of the Atlantic Forest, located in the neighborhood of a large industrial area (Bourotte et al., 2009). The total concentrations of the PAHs in this area were 3.8 times higher (0.82 mg kg−1) than those we measured. In addition, during the 45-day exposure no significant increase in the concentrations of PAHs occurred in controlled soils. The levels measured in this study are lower than the Dutch soil quality standards for agricultural use, i.e., 1.5 mg PAHs kg−1 soil. There are some reasons that can explain the lower soil concentrations measured in our study. First, we sampled garden beds, which are a mixture of local soil, clean soil and amendments. The addition of organic material to soil reduces PAH concentrations (Yang et al., 2011). Finally, the concentrations of PAHs in urban soils in tropical areas are relatively low compared to other urban areas within areas with cold or temperate climates (Bourotte et al., 2005). Although we found concentrations of PAH in non-controlled soil of all UCG, there were no significant levels in vegetables in 9 out of the 10 studied gardens. PAH incorporation in plants occur mainly by foliar uptake, by dry or humid deposition, with predominance of dry deposition (Tremolada et al., 1996; Tuteja et al., 2011). Root uptake is not considered a good mechanism for PAH incorporation in plants, because of the hydrophobic properties of PAHs (Tuteja et al., 2011). Foliar uptake can also occur as a consequence of PAH volatilization from contaminated soil (Simonich and Hites, 1994). This mechanism might explain our results of non-incorporation of PAH from soil to the vegetable leaves. We assessed source apportionment of PAH from the non-controlled soil using PCA analysis and identified two main components. 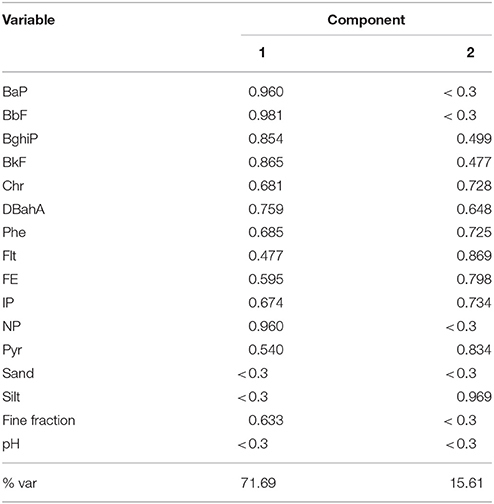 Component 1 represented the compounds with higher molecular weights (BaP, BbF, BghiP, DBahA, BkF), except for NP. The PAHs with greater molecular weights are found adsorbed onto the surfaces of suspended air particles (both the coarse and fine fractions) (Bourotte et al., 2005). These compounds can be attributed to gasoline/diesel exhaust and residual oils. DBahA, BghiP, BkF, BbF, and BaP are typical tracers for fossil fuel combustion and are associated with vehicular emissions (Ravindra et al., 2008). The correlation of this group of PAHs with the fine soil fraction indicates an adsorption process, since the sorption of PAHs to soil increases with the surface area of the sorbent particle (Gardner et al., 1979). These compounds (except for NP and BghiP) are classified by the International Agency for Research on Cancer (IARC, 2010) as possibly carcinogenic to humans. Component 2 included those with lower molecular weights (Chr, Phe, Flt, FE, and PYR), except for IP. Chr and IP are classified as 2B, or possibly carcinogenic to humans (IARC, 2010). The PAHs with low molecular weights are found preferentially in the gas phase. The PAHs associated with this component represent a mixture of sources, such as vehicular emissions (Ravindra et al., 2008), biomass burning (De Andrade et al., 2010), and oil seepage (Abdel-Shafy and Mansour, 2016) and cannot be assigned to any single source. This study has limitations. The contents of organic and black carbon in soil were not analysed. The results found by Marquez-Bravo et al. (2016) in New York indicate that soil PAHs are positively associated with air-modelled particulate PAHs, suggesting that atmospheric deposition, rather than on-site sources, may be a source of PAHs to soils. We analysed only 2 leafy vegetables, so our results cannot be generalized to other vegetables. The temperature, relative humidity, and rainfall displayed no significant differences among the gardens during the study period. This finding suggests that the potential bias caused by differences in weather conditions among the UCGs is minimal. 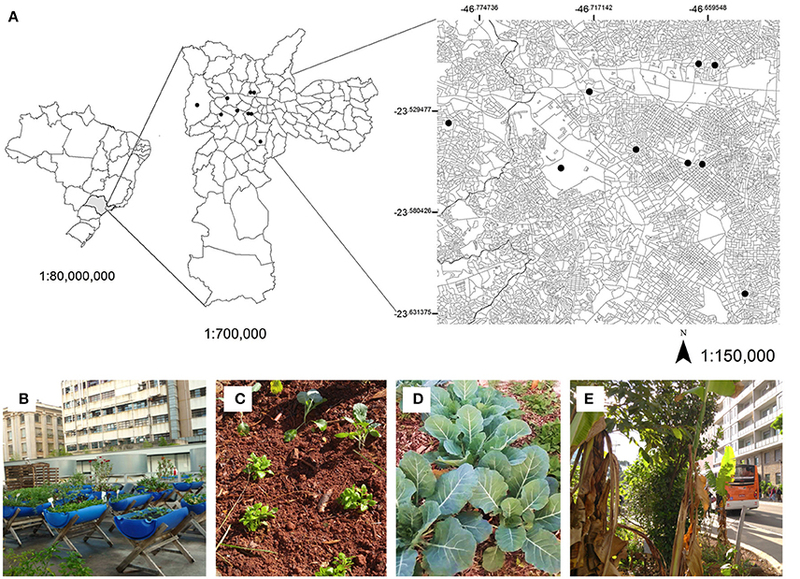 In summary, our results indicate that the growth of vegetables with short growth cycles, such as spinach and collard greens, in urban gardens in Sao Paulo was not associated with the accumulation of combustion-derived PAHs in the leaves of these plants, either cultivated in garden beds or controlled soil. Study design: LFA-L, TM, and PS. Data collection: LFA-L. Analysis of data: LFA-L and MS. Manuscript preparation: LFA-L, and TM. Review of manuscript: LFA-L, MS, PS, and TM. This study was supported by the financial support of INCT INAIRA and the Sao Paulo Research Foundation (FAPESP), project number 2014/19201-9. We thank the gardeners and volunteers (C. Visoni, C. Sampaio, N. Rigo, G. R. Ranieri, J. Roma, L. C. Santos, D. Pupin, L. Lim, and S. Shigeeda) for their assistance. Boulding, J. R. (1994). Description and Sampling of Contaminated Soils–A Field Guide. Boca Raton, FL: CRC Press, 1–240. Delschen, T., Hembrock-Heger, A., Leisner-Saaber, J., and Sopczak, D. (1999). UWSF-Z. Umweltcehm. Ökotoxicol. 11, 79–87. International Agency for Research on Cancer (IARC) (2010). 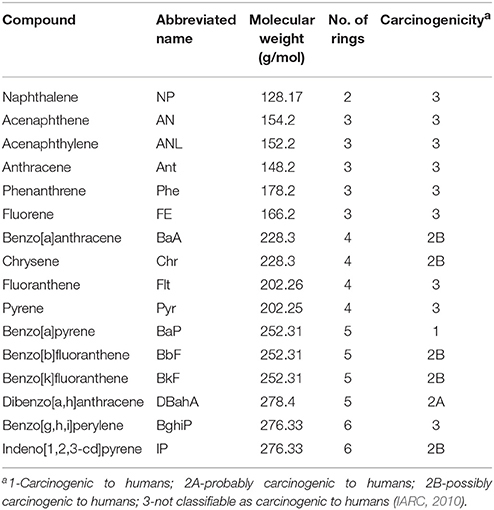 IARC Monographs on the Evaluation of Carcinogenic Risks to Humans: Some Non-heterocyclic Polycyclic Aromatic Hydrocarbons and Some Related Exposures. Lyon: IARC International Agency for Research on Cancer v. 16. Ministry of Health of Brazil (2014). Dietary Guidelines for the Brazilian Population, 1e80. Available online at: http://www.fao.org/nutrition/education/food-based-dietary-guidelines/regions/countries/brazil/en/ (Accessed July, 20 2017). Van Raij, B., Andrade, J. C., Cantarella, H., and Quaggio, J. A. (2001). Análise Química Para Avaliação da Fertilidade de Solos Tropicais. Campinas: IAC, 285. Copyright © 2017 Amato-Lourenco, Saiki, Saldiva and Mauad. This is an open-access article distributed under the terms of the Creative Commons Attribution License (CC BY). The use, distribution or reproduction in other forums is permitted, provided the original author(s) or licensor are credited and that the original publication in this journal is cited, in accordance with accepted academic practice. No use, distribution or reproduction is permitted which does not comply with these terms.